C.J. Ah You played in three games as a freshman in 2001 and had nine tackles, a quarterback hurry, and two sacks. In that third game he injured his knee and sat out the rest of the season. He then had another season ending knee injury in fall camp of his sophomore year and took a medical redshirt. 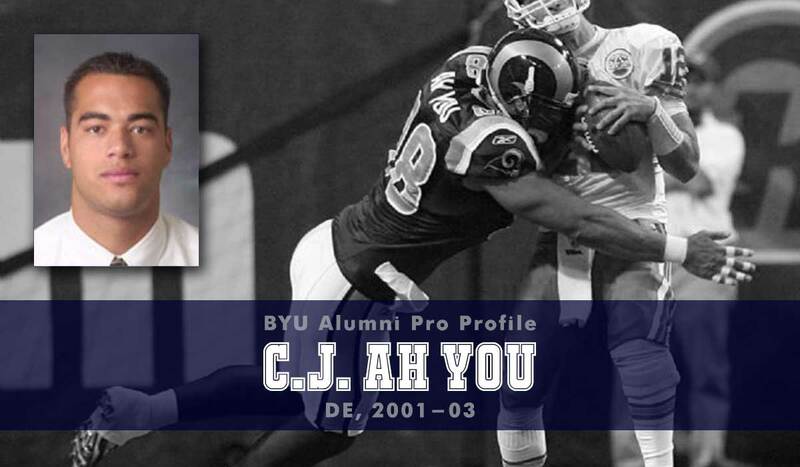 He transferred to Snow College (2004) and was an All-Western States football League first-team selection. He then transferred to Oklahoma where he was named the Big12 conference defensive newcomer of the year in 2005 and All-Big 12 first-team in 2006. In his two years at Oklahoma he had 88 tackles, with 22 tackles for loss, five pass breakups, four forced fumbles, and eleven sacks. Ah You was selected in the seventh round of the 2007 NFL draft (no. 239 overall) by the Buffalo Bills. In 2009 he was promoted to the active roster and recorded 17 tackles, one pass defended, and one sack that season. In 2010 he played in all 16 games and had 18 tackles, two passes defended, a forced fumble, and four sacks. In 2011 he played in nine games (with two starts) and recorded six tackles and a sack before injuring his knee once again. He concluded his NFL career with 41 tackles, three passes defended, a forced fumble, and six sacks.